• Think of the connections you have and the people you know – can you drop names to the media? • Identify what is in your book that the media will find of interest? • Most media coverage can take place by phone and email — it’s becoming rarer that an author needs to travel or take to a road tour. • Identify that media outlet’s targeted demographics? Based on whom they tend to reach, did you devise a pitch that appeals to that demographic? • Craft a customized pitch that would appeal to that specific outlet, based on the outlet’s past guests or story experts and subjects covered? • Provide a news peg to your story? • Do your homework about the personal preferences and life of the specific editor, producer, host, or writer that you’re pitching? • Look, based on the media outlet’s format or style, how your story idea would fit in to how they interview people or cover an issue? For instance, do they use graphics, have call-ins from listeners, use a panel format, or allow to talk for longer than a sound bite? • Time your outreach to match when the person you seek to reach is available and mentally open to receiving pitches – or are they on deadline or in production? • Communicate clearly, concisely, and with confidence. Act as if the media will say yes. Assume success – but work diligently to achieve it. • Act with urgency, persistence, and creativity? Keep reaching out to the media and give yourself a fighting chance to break through. PR is not just about giving away free downloads of chapters and books, or of tweeting and making videos, or of eblasting a press release. It is about making a sustained, strategic effort to influence the influencers and get media coverage that will help you in the short and long-term. • Can you compare your work with other known writers? • How do you describe your book in the context of your life? • How does it fit into the body of your other writings? • Can you genuinely speak with passion, confidence, and conviction? • Express it in a way that serves a need, fulfills a desire, or feeds a want – and sounds interesting in the process. • What ties your credentials into what is in the news? • Can you convert a chapter heading into a media story? What’s the Media Looking For? What Helps You Get Media? • Channel your energy, resources and creativity not just towards your writing, but to your PR efforts. • See your launch date as a coronation – not Day 1. From your launch date, you have 30-90 days to make an impression. • Forget any sense of fairness: often, the dumbest things get attention. For additional information, please contact panel moderator Brian Feinblum at 212-583-2718 brian.feinblum@finnpartners.com or consult www.media-connect.com. 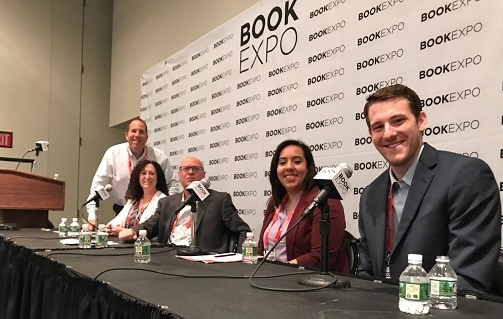 This entry was posted in General, Public Relations and tagged author branding, Author Interviews, Book Expo America 2018, Book Media, book pr, book publicity, Book Reviews, Media Connect Panel, PR Audit. Bookmark the permalink.